Squash is a vegetable that we eat year round but it also reminds me of the fall season, which will be here before we know it. 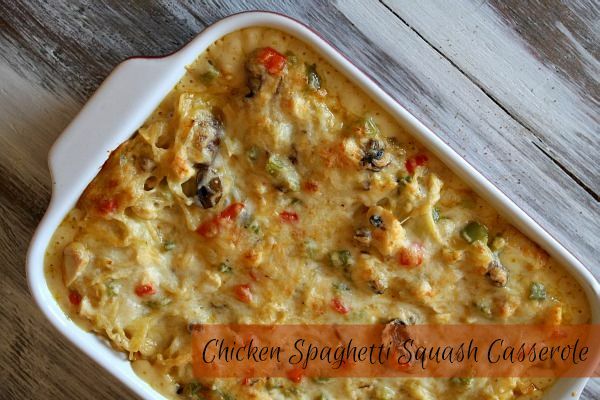 Serving Chicken Spaghetti Squash Casserole with homemade bread is a comfort meal when the fall season and cooler air moves in. Enjoy! Preheat oven to 350°. Spray a 13×9-inch baking dish with nonstick cooking spray. Set aside. In a large Dutch oven, cook bacon over medium heat until crisp. Remove from pan using a slotted spoon. Let cool; crumble. Reserve 2 tablespoons rendered bacon fat in pan. Add flour and garlic to pan. Cook, whisking constantly, 1 minute. Gradually whisk in milk, 1 teaspoon salt, pepper, and cumin. Cook, whisking frequently, until thickened, approximately 5 minutes. Stir in tomatoes with green chiles, 1 cup Cheddar, and Parmesan until melted. Remove from heat. Stir in spaghetti squash, chicken, cherry tomatoes, green onion, and remaining 1 teaspoon salt until combined. Gently stir in 3 cups cornbread. Pour mixture into prepared dish; sprinkle with remaining 1 cup cornbread, remaining 1/2 cup Cheddar, and bacon. Bake until lightly browned, 15 to 20 minutes. Let stand 5 minutes before serving. Garnish with green onion, if desired. Using a sharp knife, carefully cut squash in half lengthwise. Using a spoon, scoop out interior pulp and seeds. Drizzle squash halves with 1 tablespoon olive oil; sprinkle with salt and pepper. Place on a rimmed baking sheet, cut side down. Bake at 400° until tender, 35 to 40 minutes. Let cool 30 minutes. Using a fork, scrape squash strands into a medium bowl. Set aside.